1. Avocado Toast– Did you know that avocados are actually considered a fruit? With all the heart healthy fats and omega-3’s they contain, they’re a perfect snack to get some extra calories in. By adding avocado to some gluten free toast, you’ll be getting some healthy fiber with a kick of protein as well. There’s also plenty of things you can add to avocado toast to mix in variety, such as a drizzle of honey, melted cheese, or smoked salmon. 2. Trail Mix- Trail mix is another heart healthy snacking option to keep your appetite and your taste buds satisfied. With all the different varieties of nuts, seeds, and other additives available, there are an endless number of ways to make trail mix. Nuts and seeds are also chock full of healthy fats that help lower the risk of adverse health effects like heart disease and diabetes. You can also give your trail mix a hint of sweetness and a boost of antioxidants by adding some dried fruits or dark chocolate. Just be sure to read the labels on dried fruit to ensure there isn’t added gluten. 3. Popcorn- Many people aren’t aware of the fact that popcorn is actually a naturally gluten free whole grain! Since popcorn is a whole grain, it contains all of the vitamins and minerals found in the bran of the grain. Popcorn is also an excellent source of fiber which helps promote a feeling of fullness and keeps our digestive systems running smoothly. You can make popcorn by popping the kernels yourself, or you can find a variety of popcorn products at your local grocery store. 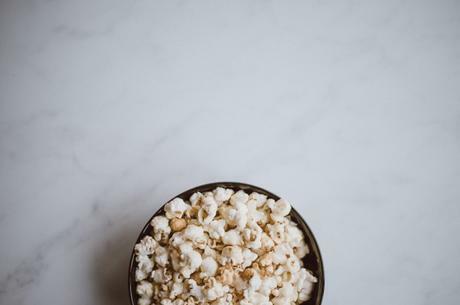 Be careful of buying popcorn products at the store; many of them are filled with harmful chemicals and artificial flavorings. This popcorn is a safe bet! 4. Peanut Butter Banana Wrap– Who doesn’t like the classic peanut butter and banana combination? Spread yourself some peanut butter onto a gluten free tortilla and top it with some sliced up banana for a delicious healthy snack. The peanut butter provides healthy fat and some protein while the banana and wheat wrap give you a nice dose of healthy carbs, vitamins and minerals. When it comes to macronutrients and nutrition, this healthy snack checks off all the boxes. 5. Protein Oatmeal– There are countless ways you can prepare oatmeal, which makes it a fantastic snack. Adding gluten free protein powder to your oatmeal is a perfect way to hit your daily protein intake and give yourself a break from your standard boring protein shake. If you want some extra flavor, throw some honey, nuts, or seeds in too! 6. Protein Bar- There are a ton of gluten free protein bars out there to choose from and they make for great snacks. Protein bars are especially convenient when you’re on-the-go and need something quick and mess-free. Try avoiding ones that have too much added sugar or artificial ingredients and pick a protein bar that’s made with wholesome ingredients instead. 7. Cottage Cheese- While this might not meet everyone’s taste bud requirements, cottage cheese is an excellent source of protein and various vitamins and minerals to help keep your hunger levels low and your body well-nourished. If you’re not a big cottage cheese fan, try adding some honey and fruit to spice it up! 8. Greek Yogurt and Berries- If cottage cheese isn’t your thing, try greek yogurt instead! Greek yogurt is loaded with protein; many varieties of plain greek yogurt containing over 75% of their calories from protein! In addition to the favorable protein content, greek yogurt has millions of healthy bacteria which help aid in digestion and keep your gut biome healthy. Like cottage cheese, greek yogurt goes great with fruit, nuts, seeds, honey, and more, but start with plain flavored yogurt to avoid added gluten in dried fruit or flavorings. It’s more fun to see what kind of healthy creations you can come up with yourself anyways! 9. Veggies and Peanut Butter- It’s hard to beat the classic combo of veggies and peanut butter. It’s an awesome way to get some additional vegetables in your diet, and since they’re covered with peanut butter, they taste like dessert! Vegetables like carrot sticks, celery, and cut peppers are perfect for dipping into peanut butter. If you want to switch things up a bit, try eating your veggies with cashew or almond butter! 10. Veggies and Hummus- If you’re watching your calories and you want to enjoy your veggies without having too much fat from peanut butter, try dipping your veggies in hummus! Hummus is made from chickpeas, which are a great source of plant based protein. Chickpeas have also been shown to reduce the risk of developing heart disease and hypertension! It’s incredibly common to find yourself hungry in the middle of the day and looking for something to munch on between meals. When it comes to snacking, there are a lot of foods out there that are full of artificial dyes, sweeteners, preservatives, and other potentially harmful chemicals. Luckily, there are plenty of healthy snack options out there to help optimize health and muscle growth. Just be careful when buying pre-packaged foods by reading the nutrition facts to avoid these things and unexpected gluten.